“104 and Holding”, a watercolor by Choctaw artist Joyce Hartmann, was selected for Mid-Southern Watercolorists 45th Annual Juried Exhibition at the Arkansas Arts Center, Little Rock. A watercolor by Choctaw artist Joyce Hartmann has been selected for Mid-Southern Watercolorists’ Annual Juried Exhibition to be held in the Arkansas Arts Center, Strauss Gallery, Little Rock, Feb. 13 to April 12. 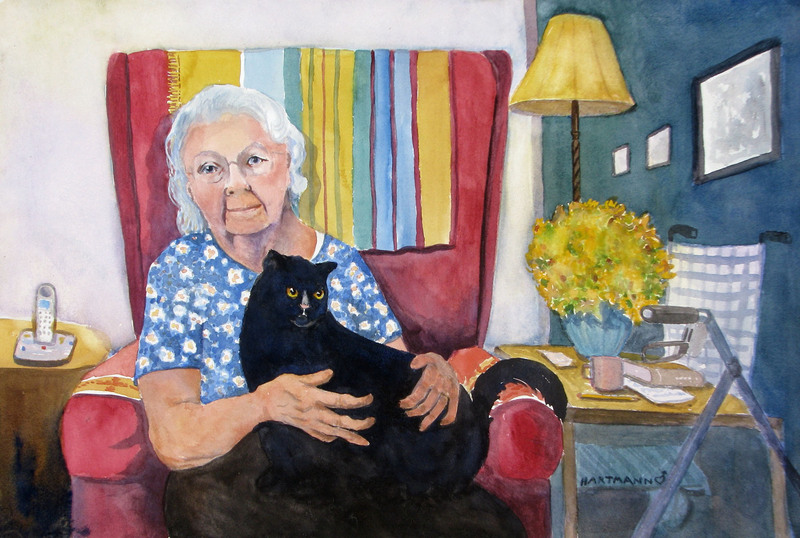 Joyce’s watercolor “104 and Holding” is a portrait of a 104-year-old Ozark woman holding her large black cat. Now in its 45th year, the exhibition received 149 entries by 81 artists. Guest juror and nationally recognized watercolorist Linda Baker narrowed the entries down to the thirty works selected for the exhibition. A member of the American Watercolor Society and the National Watercolor Society, among other professional groups, Baker is intrigued by the gentle translucence of nature. Founded in 1970, the Mid-Southern Watercolorists includes more than 200 members in over ten states across the mid-South. The organization is one of the largest and most active art societies headquartered in Arkansas. The opening night reception and awards presentation will be held Friday, February 20th, beginning at 6:00 p.m. in the Lower Atrium of the Arkansas Arts Center. The public is invited to view the free exhibit and attend the reception.